To coincide with the upcoming release of Rise of Immortals, we interviewed ROI's Lead Community Manager, Mathew "Berek-PG" Anderson. He talks about Petroglyph Games, Rise of Immortals and the Dota genre. 1. What makes Rise of Immortals stand out against other games in the Dota genre? We have several things that provide uniqueness. The first is a new Player vs. Environment (PvE) gameplay mode. While the game is at its core a PvP Dota, we wanted to ensure players are warmed up to the PvP experience with an easier way to learn the game's mechanics. PvE is also great fun for anyone looking to take a break between PvP sessions. Rise of Immortals also has persistence on the Immortal that provides a deeper level of ownership to the player's character. When first starting the game you are brought into a mini-map waiting area, the social hub. This area allows players to show off their Immortal directly, as well as find groups before a match is formed. Guilds and other features will be developed for this area as well. 2. What were the things that pushed Petroglyph to make a stand-alone Dota game? We had an existing engine and some assets that fit the game model well. It worked so well in fact, that we've only been developing the game for little over a year and are already about to launch! 3. Why did Petroglyph select the free to play route for ROI? The industry is fast moving in this direction for several reasons, though one of those that we thought RoI would benefit from a F2P model is the community building aspect. With a low barrier to entry, players can get interested in the game a lot easier. We can then build upon the existing content with cool new items and features that players may be interested in exploring. 4. How will ROI handle leavers, AFK'ers, trolls and deliberate feeders? What plans does Petroglyph have to reduce the number of games that get ruined? This has been a big topic in both the development team and community. Dota games are very competitive between players by their core design. We recognize this and have been diligent in identifying problems the community presents to us, and then working on solutions that will satisfy both newer players and those that have been around for awhile. As with many online games, the system will continue to be fleshed out given further community feedback. 5. Which Immortal would you recommend to someone new to the genre? Scorpix is one of the easier Immortals to get used to, being a more direct melee (DPS) character. Kyrie is another good one. All of the Immortals have a difficulty ranking on their official pages at riseofimmortals.com, as well as other statistics to see which one you might prefer to start with. We will be expanding these sections out at launch. 6. Message to the DotA / ROI community. We have a core Dota game you will recognize when first entering, but be pleasantly surprised at its many unique gameplay features afterward. In many respects, this was possible only with the community's involvement during the beta phase. Throughout the game's development, we have kept in close contact with the community to ensure that this balance is well refined for the game's launch, and want to continue to grow this relationship as we expand the game further. Mathew Anderson graduated from the University of Wisconsin-Oshkosh (United States). 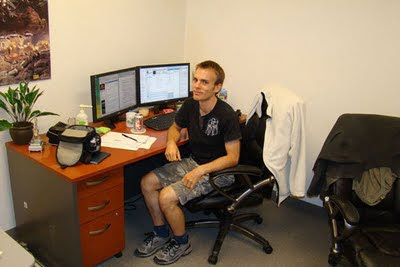 He started working for Petroglyph Games in 2009 and is the current Community Manager for Rise of Immortals. Seems like a cool guy. Glad to see some more competition in the Dota genre.